Other Sports - 05. October 2007. 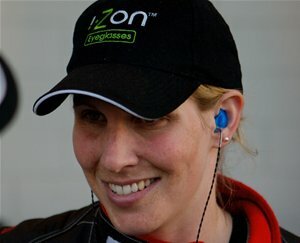 Halliday, who combines her two sporting careers as a racing driver and as a three day eventer, had planned to return to the ALMS, where she is the most successful female driver in series history, for the final two races at Road Atlanta and Laguna Seca this month. However, she will instead undergo a final operation next week on the injury she suffered in an eventing accident in July, before concentrating on regaining her fitness for 2008. “I’m sad not to be finishing the season in the US, but the most important thing is to make sure the injury is healed properly and to prepare for next season” Liz said. Despite Halliday’s frustrations at her lack of sporting activity during her enforced lay-off, she has still enjoyed a busy few months, something which will continue over the next few weeks. Liz said: “I’m going to Las Vegas this week to represent my major sponsor iZon Eyewear at the Vision Expo West trade exhibition. I really enjoy these kinds of events and although I’d love to be racing at Road Atlanta, it’s good to be able to have the time to work with iZon at such an important trade fair. For hi-res photos of Liz for use in editorial please visit www.lizhalliday.com. The Petit Le Mans at Road Atlanta will be screened LIVE on Motors TV this weekend. Visit www.motorstv.com for listing details.